Summer holidays are finally here. The idea of getting away from city life is always fun. But the reality is that it’s scorching outside, most of Korea is well over 30 Celsius degrees, and everywhere you go will be crowded with holidaymakers. Plus, the roads are already packed with millions of vacationers. When you do finally reach the beach after hours stuck in highway traffic, you find yourself swimming shoulder to shoulder with others. Koreans often say the beaches are “half water, half people” in the summer. Turning to overseas destinations, one may realize that it’s too late. Don’t even mention the long lines at the airports. Plane ticket prices skyrocket. It’s no wonder many think about just staying at home. Part of the staycation trend in Korea is “hocance,” a Korean neologism meaning spending a vacation in a hotel, and a growing number of people are spending their holidays at local hotels. “It’s about escaping the daily life. I don’t necessarily have to go somewhere to escape,” Yoon Hye-ji said. Working at a local design company, she plans to spend the summer vacation at a local five-star hotel, like she has done for the past two years. Yoon has a few conditions for choosing her hotel: It should have an outdoor swimming pool, have a great culinary lineup and be in or near Seoul. “I don’t want to get stuck in heavy traffic and drive for long hours. It’s called a vacation, why should I be stressed about spending my time, money and energy?” she said. On a weekday morning, Shilla Hotel’s outdoor pool was packed with guests like Yoon enjoying a morning swim. The high-end hotel in central Seoul has been mentioned as a top summer destination thanks to its luxurious outdoor swimming pool area, Urban Island. 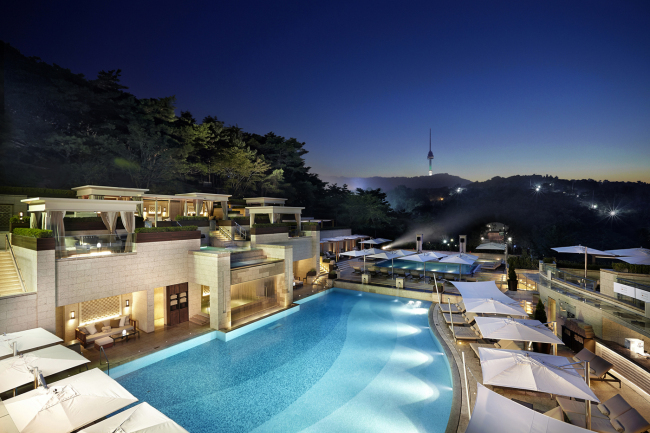 The swimming pools offer a scenic view of Namsan. A separate kids’ pool and a jacuzzi are available as well. The cabanas, which costs approximately 700,000 won for a day, makes the swimming pool seem like a tropical resort. 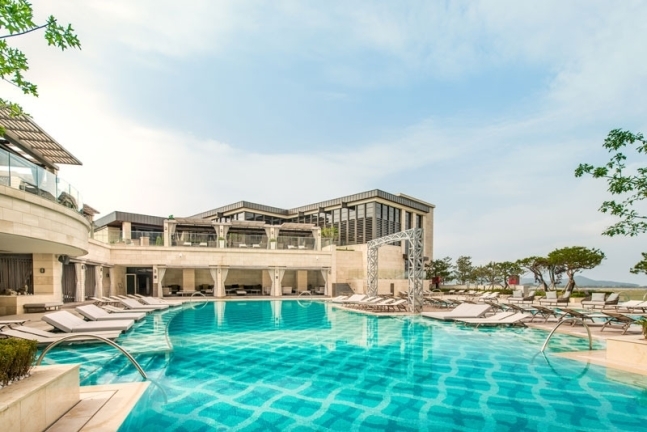 “Because the sunbeds are limited, it is important to control the number of guests,” Kim Soo-bin, the hotel’s PR manager said, referring to the policy that only the guests who purchase hotel packages have access to the pools. Her words proved right, as most of the guests at the pool were families with young children. They have been playing a big role in the local staycation industry, according to numerous high-end hotels. When searching for the word “hocance” in Korean on social media, thousands of the posts are updated by mothers with young children. They say, it is hard to travel to a faraway place with babies, as they can’t deal with long flights. The hot weather also limits the options for families with babies, as they can’t spend too long out in the heat. So, they turn to local luxury hotels equipped with swimming pools. Welcoming the family guests, many hotels offer necessary products related to child care for free. Paradise City in Incheon, an hour’s drive from Seoul, is one of them, renting out baby bottle sterilizers, baby strollers, air purifying humidifiers, a cot and a tub for the baby for free if requested. But the hotel is not just for family guests looking for a comfortable stay, it offers exciting entertainment too, when the sun goes down and lights go up. It actually has been promoting itself as an “artainment” resort, hosting luxurious pool parties. Other hotels such as Seoul Dragon City, Nest Hotel and Banyan Tree Club & Spa Seoul host exciting Ibiza-style pool parties in the summer. “Usually the pool parties are all inclusive of drinks and foods. I want to enjoy everything at once. It’s the holidays. Why should I worry about planning? It is one-stop luxury,” Yoon said.